This may be a bit controversial, but I’ve been looking into the Christian monarchist movement recently, and I’m starting to think we can make a compelling case from Scripture as to why we should have a King. And I’m not talking about the US joining the British Commonwealth (Deuteronomy 17:15) or becoming a constitutional monarchy, but an absolute monarchy. In fact, it is never mentioned in the Bible. There was a time when God’s people had no King, but the anarchy under the judges was not a good thing. And democratically electing leaders may not be the best way to go. Shouldn’t we let God choose our leader? Which is difficult to do if you don’t have one. Ecclesiastes 8:2 I counsel thee to keep the king’s commandment, and that in regard of the oath of God. Ecclesiastes 8:5 Whoso keepeth the commandment shall feel no evil thing: and a wise man’s heart discerneth both time and judgment. First Peter 2:14 Or unto governors, as unto them that are sent by him for the punishment of evildoers, and for the praise of them that do well. First Peter 2:16 As free, and not using your liberty for a cloke of maliciousness, but as the servants of God. First Peter 2:17 Honour all men. Love the brotherhood. Fear God. Honour the king. Proverbs 8:15 By [wisdom] kings reign, and princes decree justice. But even if they aren’t, we should still obey them. We could look at how David refused to harm Saul even when he was trying to kill him. First Samuel 24:6 And he said unto his men, The Lord forbid that I should do this thing unto my master, the Lord’s anointed, to stretch forth mine hand against him, seeing he is the anointed of the Lord. Or we could look at how Jesus told the Jews to obey the Roman Emperor. We could also look at the books of Samuel. They’re a bit confusing to read. It’s almost as if Samuel couldn’t make up his mind whether having a King was a good idea or a bad one. For example, here’s one passage that makes it sound as if God’s people had rejected Him by wanting a King to rule over them instead of a prophet. First Samuel 8:6 But the thing displeased Samuel, when they said, Give us a king to judge us. And Samuel prayed unto the Lord. First Samuel 8:7 And the Lord said unto Samuel, Hearken unto the voice of the people in all that they say unto thee: for they have not rejected thee, but they have rejected me, that I should not reign over them. But then as we read on, we see how having a King enabled God’s people to unite and defeat their enemies. The country seems to be divided at the moment and it has so many enemies — North Korea, Mexicans, Muslims. 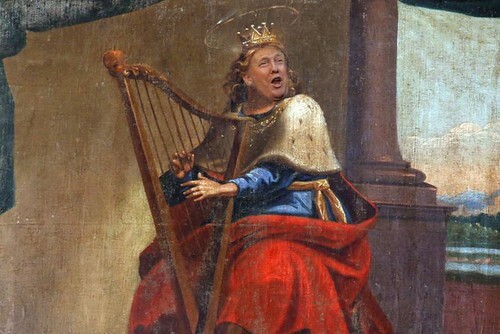 Could Trump be another King David and deliver God’s people from their enemies? 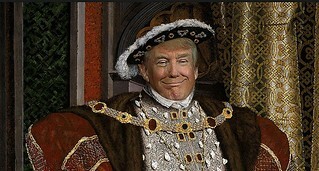 Having a King would also help us to set up a Theocracy. The King is required to write a copy of God’s law for himself and read it every day (Deuteronomy 17:18-20). A good King could be a religious reformer like Josiah (Second Chronicles 34:1-35:27). How can monarchies be bad if Jesus is a King? We’re soon going to be living under one when Jesus comes back, if you accept a literal reading of the Bible. 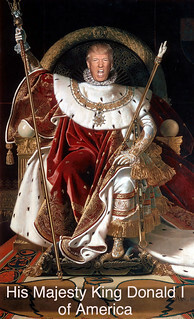 He will rule as King on earth from Jerusalem for 1,000 years and then for ever on the New Earth from the New Jerusalem. Psalm 48:2 Beautiful for situation, the joy of the whole earth, is mount Zion, on the sides of the north, the city of the great King. Revelation 19:12 His eyes were as a flame of fire, and on his head were many crowns; and he had a name written, that no man knew, but he himself . . .
Can we really come up with a better system of government than God? Do we now have a suitable candidate? I think it would be nice if we could lock in Trump. I don’t want to think about getting stuck with a Democrat if they one day actually suspend democratic elections, like they always secretly want to do.